The Brabender® Plasti-Corder® Lab-Station / Lab-Station EC represent the new generation of torque rheometers for all kinds of process-technical investigations or processing tasks in laboratories and simulation. The Plasti-Corder® Lab-Station and Lab-Station EC are suited for mixers and extruders including a temperature control. The universal docking station ensures the adapting of mixer and extruder. With a speed range of 0.2 – 350 min-1, the 16 kW-powered Plasti-Corder® Lab-Station is beside operating the measuring extruder type 19, the conical twin screw extruder, the co-rotating twin screw extruder TSE20/40 and measuring mixer type 30/50 and P600 especially suited for Brabender® single screw extruder type 30, twin screw extruder 25 and mixer type 350. 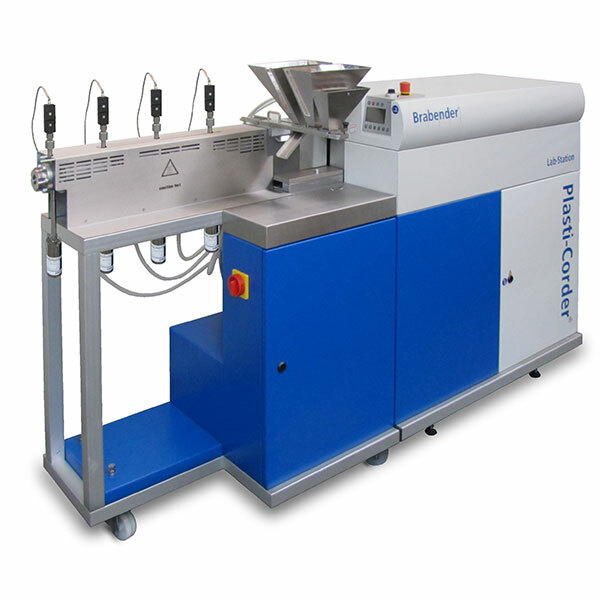 The “smaller” Plasti-Corder® Lab-Station EC with a speed range of 0.2 – 200 min-1 and 6.8 kW-drive unit fulfills the possibility to adapt Brabender® single screw extruder type 19, conical twin screw extruder as well as mixer types 30/50 and P 600. The new CAN bus control panel is installed for paramter settings & digital and diagram value indication.